One of the most brilliant things about the Animated Clone Wars series is the opportunity to explore the evolution of technology. Whether Lucas meant it or not, there is a certain visual aesthetic that evolves over the course of the series. Episode 4 featured worn out technology. Everything looked used, dirty, cannibalized. With episode 1, all the technology is new and shiny Chrome ships and bright neon lights. From episode 2 into Episode 3 we begin to see glimpses of this technology being used, getting worn and battle scarred. But It is in the clone wars that the designers have an opportunity to explore the technology of the saga. 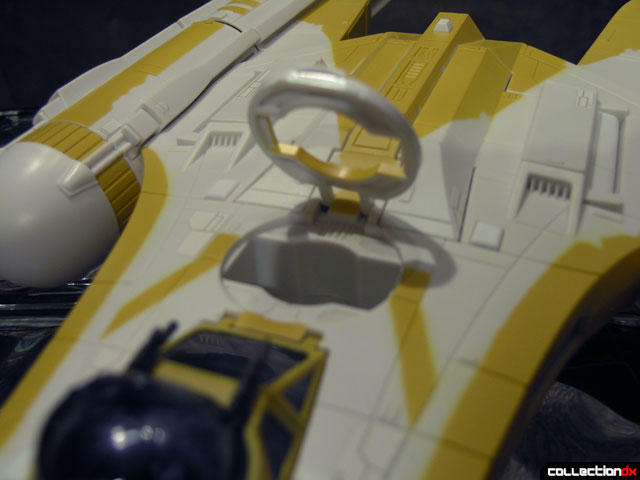 Already a myriad of new vehicles have been introduced to the series, but we’ve also gotten to see the origin of one of the rebellion’s most classic vehicles – the Y-Wing fighter. 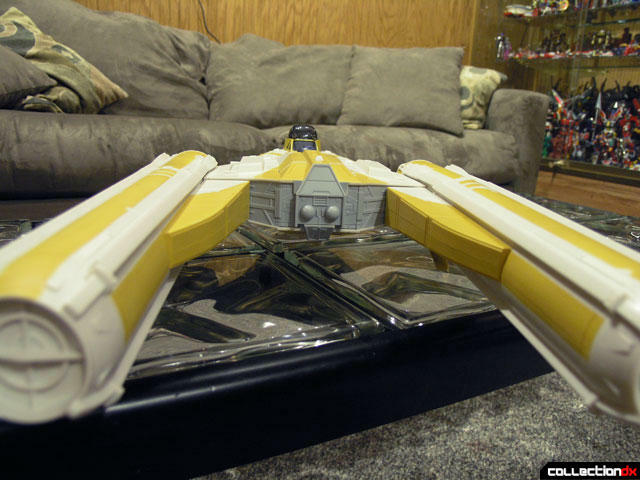 The Y-Wing we grew up with in the 80’s was a skeletal vehicle. It doesn’t have a big part in the movies, and is seen only briefly in the hangar on Yavin and during the death star run. But once Kenner decided to make a vehicle of it, it instantly became a more important part of the mythos. The original toy was fantastic. I had one as a kid. 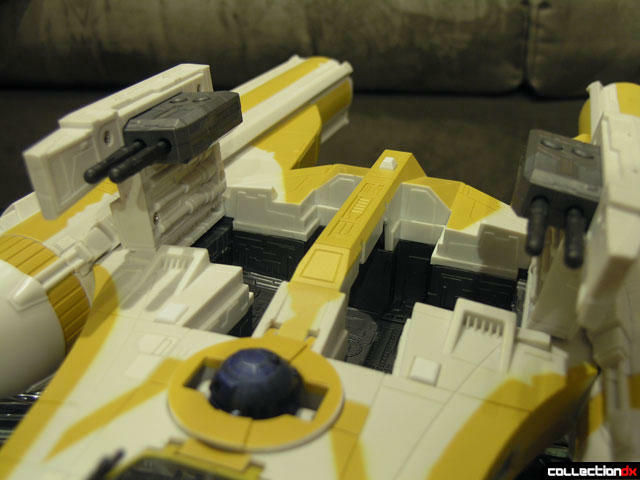 It was loaded with gimmicks like dropping bombs, a rotating turret, and an electronic buzzing sound. Another cool feature was the ability to place your own astromech droid behind the pilot – something the X-Wing lacked. 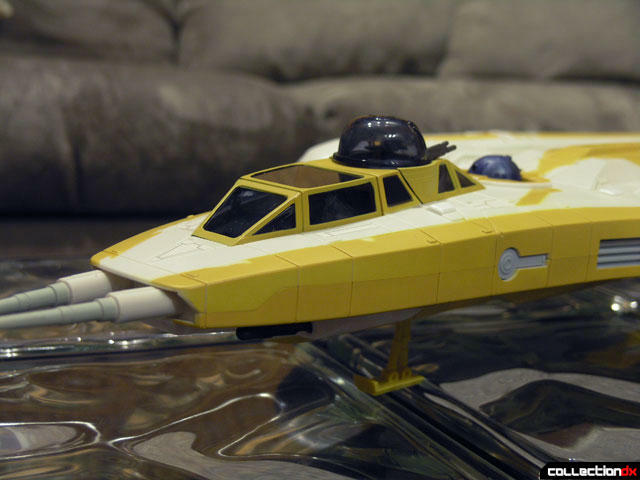 All that plus lever activated landing gear and an opening cockpit – well, damn that was a great toy. It is no wonder we all have such fond memories of it. The one from my childhood is long gone, in a dump somewhere I am sure. So when a re-release came out recently I was all over it. It brought back memories. Unfortunately, they took a lot out of the toy. No electronics, no motorized turret, no removable droid. 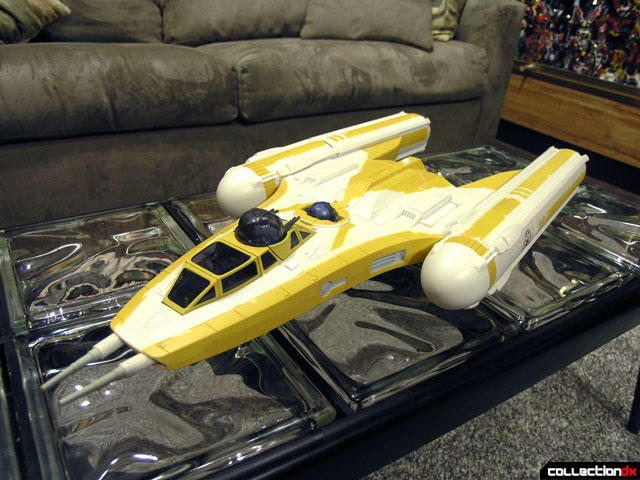 Hasbro had done a new x-wing a few years ago that was in-scale with their 3/34 figures and it was epic – why not do this with the Y-Wing? 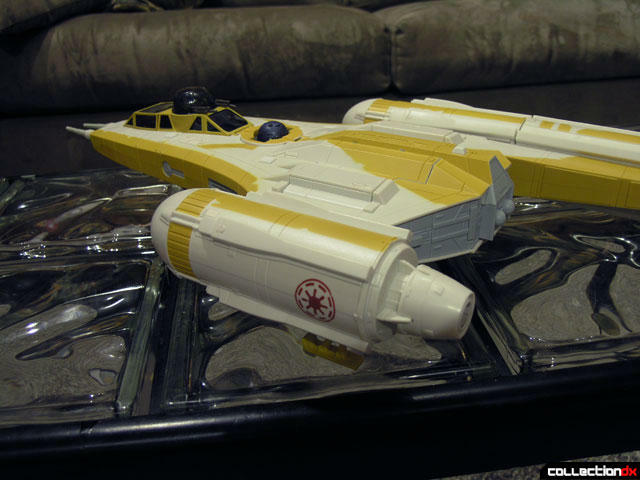 Someone must have heard my wish, because at this year’s toy fair Hasbro announced a new Y-Wing…. From the Clone Wars. 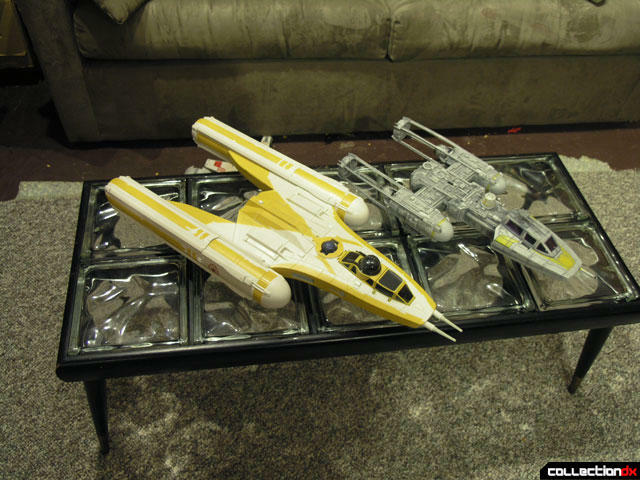 This Y-Wing appears to be in-scale with the 3 ¾ figures and represents the ship as it was new, before all the armor had been removed. The rebellion modified the hell out of their ships, and one way was to remove unnecessary plating to increase speed and maneuverability. This toy is a monster. It is grand in scope. It makes me feel like I am 10 again. It makes me feel small. The box is big, but not as big as some of the recent offerings. 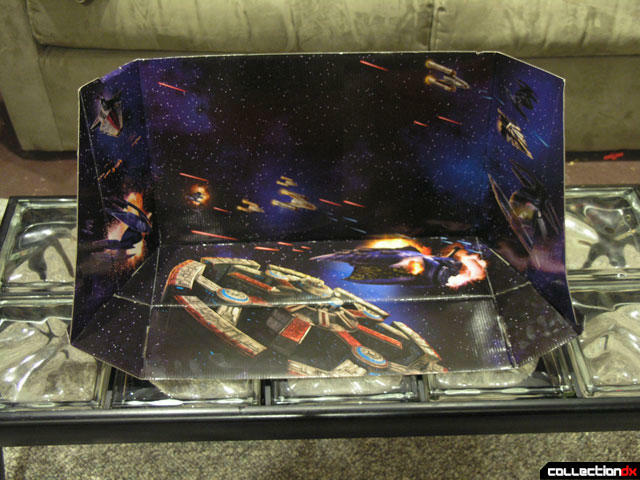 It’s sturdy cardboard, with a die-cut front showing an action scene through the holes. This is part of a gimmick where part of the box becomes a diorama. Taking the toy out is simple, and there is little assembly. 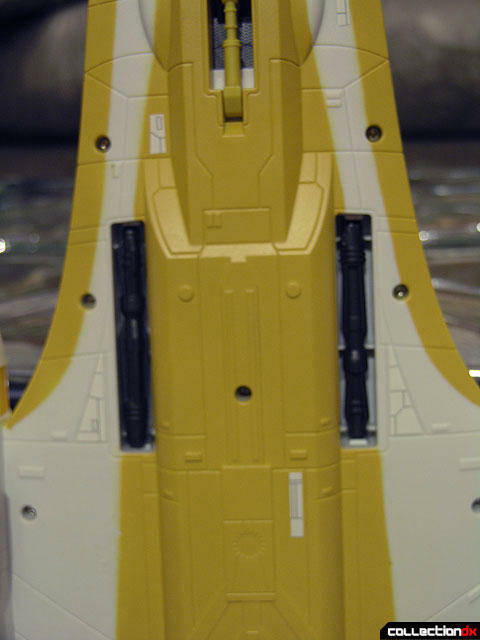 The long engines need to be snapped in, and the missile launchers attached. Included is an instruction sheet, catalog and sticker sheet. The stickers are old-school. They feel like they are made out of paper, and all they do is add a little texture around the vehicle. There are maybe 30-or so stickers, most of them off-white. The cockpit holds two figures – one pilot and one gunner. The pilot cockpit opens from the side (like the old one) and features a separately molded steering wheel and detailed interior. The rear seat is covered by a smoky translucent dome with tilting cannons. This too has a molded steering apparatus. Unfortunately, the turret does not rotate, and they don’t tilt that much. On either side of the cockpit are buttons to launch missiles under the nose. These buttons are sort of flat and easily missed. In fact, what ends up happening is I forget the button is there and when I grab the vehicle I end up launching the missiles. Behind the cockpit is a place to store an astromech droid (not included). You need to lift the panel up to fit the droid inside. The space seems too deep to fit a clone wars droid, as the head of the droid just barely pops out. Perhaps if you leave the third leg in? 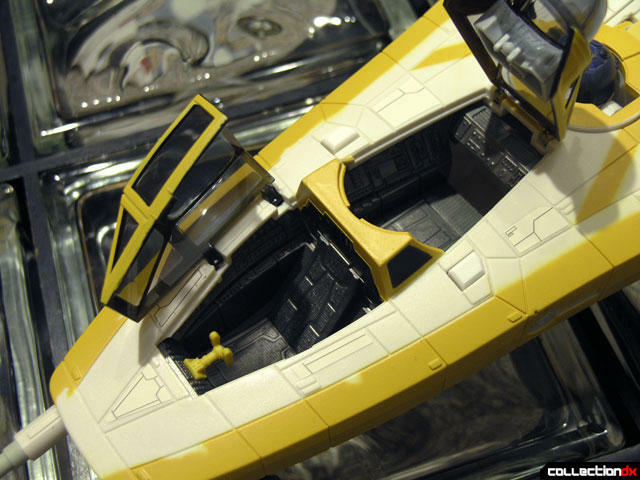 The next major gimmick is the opening bays on the body. Pressing buttons on either side opens the spring-loaded top doors in a slow, fluid motion. 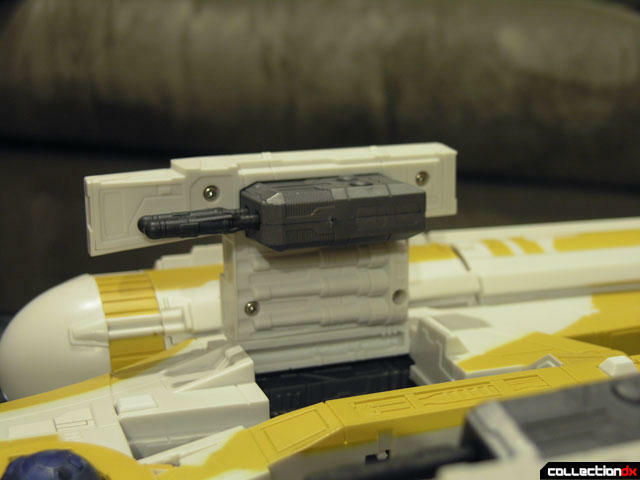 The missile launchers on the doors can each hold two missiles which fly off at the press of a button. 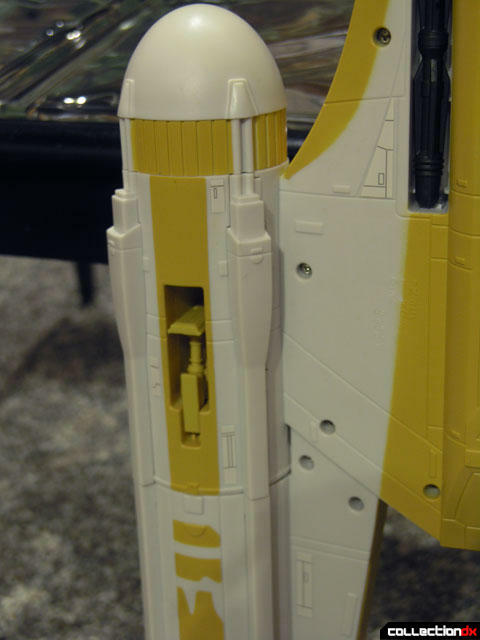 The cavity left inside is huge, and can store all of the missiles and then some. 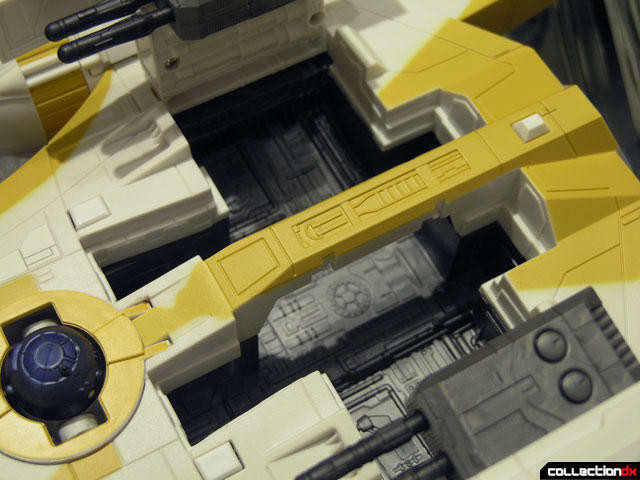 Extra details like the detailing inside the ship really make a big difference. 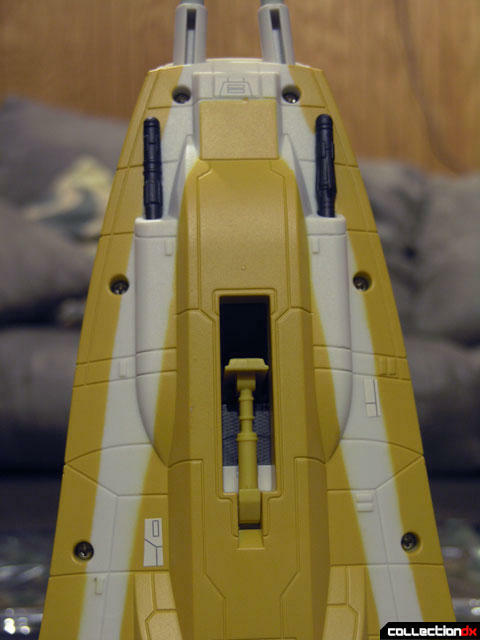 The two large engines on the back are removable. The instruction book actually lists this as a play value item, saying it simulates Battle Damage. Once each engine is removed you can see the same engine that is visible on the classic Y-Wing. Underneath the ship you have three landing gear that need to be lowered manually, as well as two bombs that can be dropped by pressing buttons above. That diorama I mentioned? Useless. It’s not long enough to fit the 27” long Y-Wing. Also - it’s about $65.00. And for that we should get a little something more. Maybe lights? Included figures? Weathering detail? Removable panels? Who knows. But this is how these things are these days. Everything costs more, and if we want vehicles of this size, we will have to pay for them. Personally, I don’t regret this purchase one bit. Now, where to put it? If it was able to strip down to the bare bones version I'd be interested, but Clone Wars isn't what I care to pay attention to. I hope this at least opens up the possibility of a large-scale Episode IV version. Too bad, togo. For me, Clone Wars is fulfilling the promise of what Star Wars could be, far more than any of the films. It's like the novels--gritter, more detailed and deep, realistically showing the violence and cost of war, etc. A recent episode, where 3 Jedis had to lead their separate attack groups to a landing zone of Genosis was brilliant and engrossing. I bought the ship, too, and totally agree with Josh's review. This thing is MASSIVE. And it's solid. So playing with it is a workout. Heh. But that only reinforces the nostalgia it inspires. 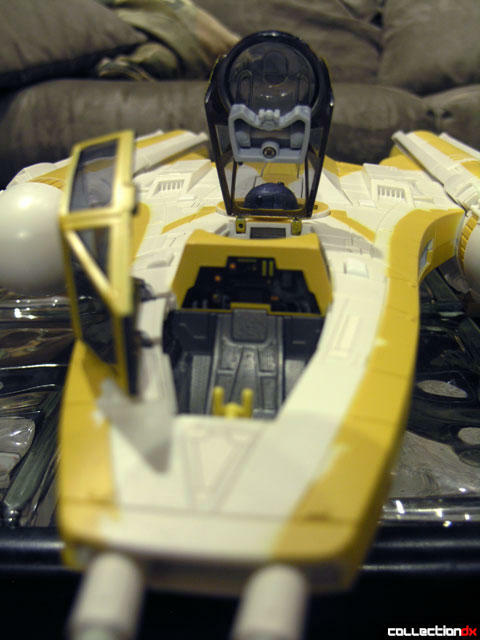 I had a yellow and maroon R5 droid handy, and he fits in there perfectly. He does have his third leg in, so you may be right about that, Josh. I'll have to check, but aren't clone wars droids slightly smaller than saga or other prior Hasbro astromech droids? "Too bad, togo. For me, Clone Wars is fulfilling the promise of what Star Wars could be, far more than any of the films. It's like the novels--gritter, more detailed and deep,"
Come on,"gritty"? It's not really a bad cartoon,but it's far from "gritty". A little girl angelfish nicknamed "Snips" fighting a bounty hunter alien dressed as an old west cowboy in a black hat? LOL. Star Wars, from it's earliest inception, has always been a western in space. And you're going to balk at a character because he wears western-style clothes? That's just funny. I didn't like the constant bratty attitude of "Snips", nor did I like the heavy use of silly battle droid humor. But those quickly faded into the background. The show is evolving. There is a sharp military sci-fi story being told, if you give it a chance. Like I said, the last episode was full of intense fighting, including a great many fairly graphic clone deaths. Some were so shocking that I kept questioning if this show was for kids at all. I find that quite a few old-school fans find reasons to dismiss Clone Wars without ever really watching it objectively. That's fine, but it's their loss. There are great stories being told. Yeah,I realise it's always been part western,but there's a difference between calling Boba Fett a "bounty hunter" to invoke connotations of the old west and dressing up a blue alien in a cowboy outfit because LOL TEXAS IN SPACE!!!! Anyway,I'm not flaming or whatever,I have enjoyed the episodes I watched,but I wouldn't refer to them as "deep". IMO the show isn't really any different then Droids or Ewoks except for the fact that those were based on good movies,and Clone Wars is based on a movie where Darth Vader is a rebelious teen eloping with his GF because NOONE UNDERSTANDS ME!!!!! I'm with Japestar on the Clone Wars love, it's a really great series and while admittedly it isn't the deepest show out there it is pretty deep for Star Wars and and a "cartoon" to boot; it's certainly deeper than any previous animated Star Wars and I'd argue that it's deeper than Ep. ! and maybe even 2. The show does a pretty good job at fleshing out the events of the Clone War that were sort of glossed over during Ep. 2 & 3 and the writing is (sadly) better than the writing for the prequels. 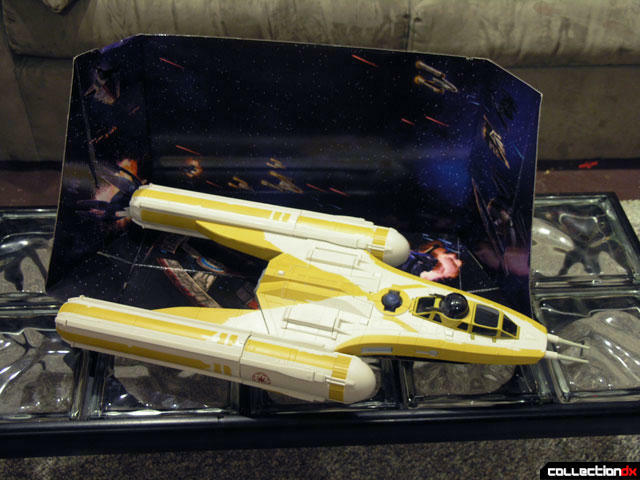 Even though I haven't collected or bought any Star Wars toys in ages this new Y-Wing toy has me tempted. I really like the look of the new/old Y-Wing and was pretty excited to see it the first time they showed on Clone Wars. 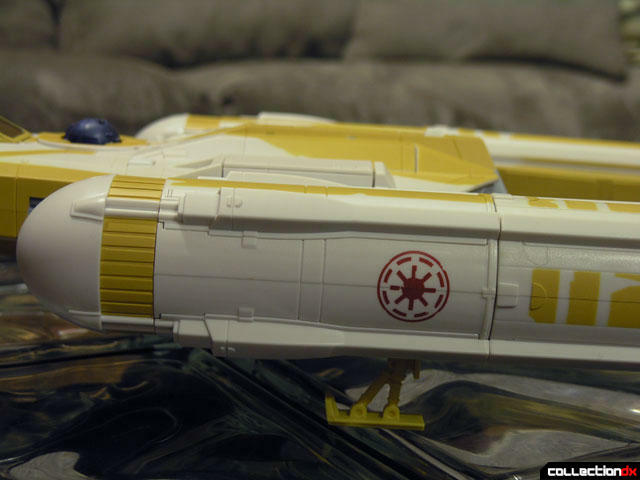 I like how it's recognizable as the Y-Wing we all know and love from Ep. 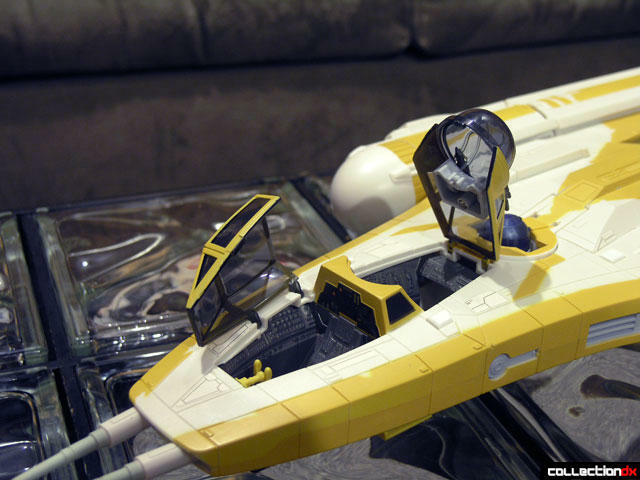 IV yet at the same time clearly different like an earlier model of Y-Wing. 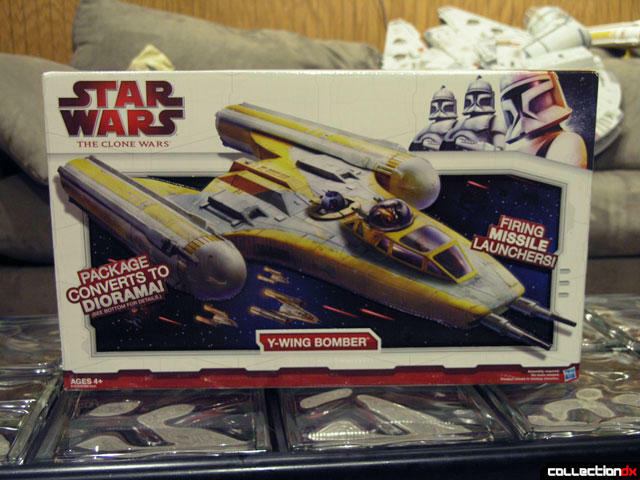 I wonder if we'll see an early version of the X-Wing like this Y-Wing although there is less that could be done to it except clean it up to make it look newer.